First came Stan Smith, then came Superstars, and next there were Gazelles. Adidas's steady re-releases of throwback sneaker concepts have led to one It sneaker style after another over the past several years. And as of today, the brand's latest re-release is destined to continue the trend: the new and improved Campus Sneakers. First released in the early 1980s, the Adidas Originals Campus Sneakers were first introduced as men's on-court basketball shoes. The retro style has had many reissues over the past four decades, but this month's release is "set to receive one of its strongest retro campaigns yet," as Footwear News puts it. 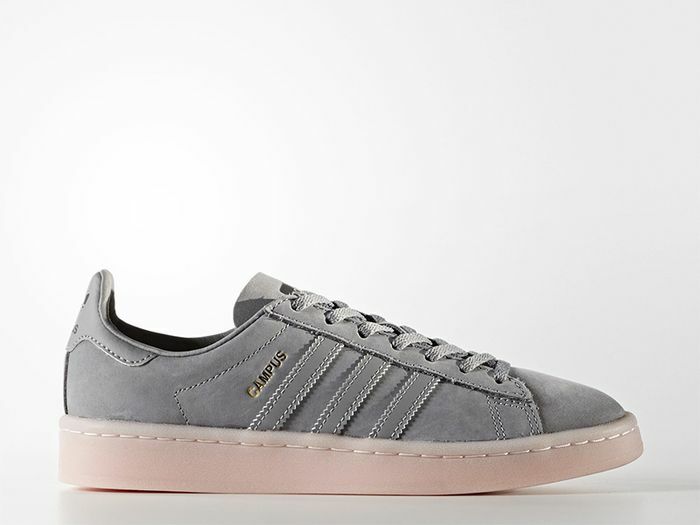 Thus far, Adidas has introduced four colorways for women (all retailing for $80 or $90), with two of them featuring on-trend Millennial Pink soles, which are sure to be the first to sell out. Don't be surprised to see the new Adidas ambassador Kendall Jenner wearing the soon-to-be It sneakers out and about very soon. Keep scrolling to shop the newly reissued Adidas Originals Campus Sneakers! Next up, find out which sneakers fashion girls can't stop buying.